Price is per bead, drilled ready to thread. 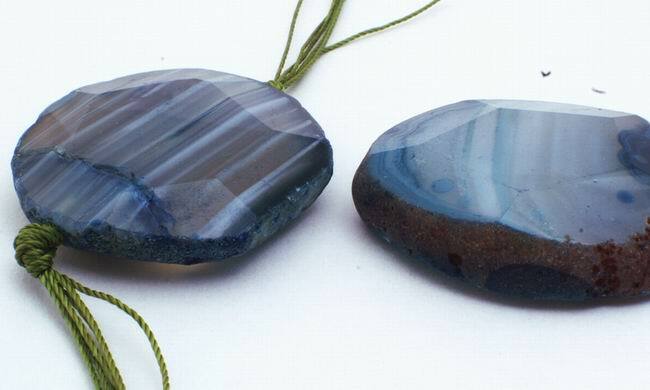 These large agates are ideal for a focal bead or pendant. Each will be slightly different size, shape, color and pattern - but all are cut to diamond facets and measure around 45mm x 38mm x 11mm. Beautifully polished with natural edges. Botswana agate is a purplish-gray fortification gemstone with white circles or ovoids. Usually, it is found in the form of nodules. Legends abound about Botswana agate - like it can be used to stimulate the exploration of the unknown and to further one’s quest towards enlightenment. Botswana Agate is also said to maintain a forthright character and sustain an attentiveness to detail.